Expect the unexpected when you look up into the leaf bare November woods. 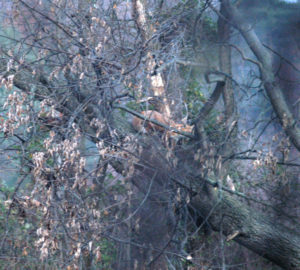 Here a red fox walks up a leaning tree to rest 30 feet high in the crotch of an adjoining tree. 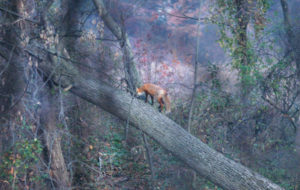 Red fox are not known to climb trees as are gray fox., but this fox channeled his inner gray fox to climb to dizzying heights. November is the far side of autumn, a time when the colorful drapery of October is taken down to reveal the bare structure, upon which fluorescent orange leaves once hung. The change in scenery is quite dramatic, as we pass through the colorful curtain that decorated the first full month of fall. I imagine standing behind a waterfall where colorful autumn leaves flow like cascading water to create a transparent wall of scarlet, orange and yellow. As I reach out to part the flowing colors, I step forward into November. Linear brush strokes of gray and brown now dominate. Light and rain play with intensity of tone as the bare trees alternate between tans and gray to darker shades of brown and black. Rain saturates the branches to shift subtle earth tones to the bold end of their color spectrum. The fading light of dusk and early light of dawn erase all color to turn trees into black silhouettes. The interlaced network of branches and solitary trees become one dimensional, as any perception of depth is lost against the stark contrast enhanced by the loss of daylight. A dynamic lightshow in the sky then commences with a pale yellow glow as the sun departs over the horizon to melt into a pool of fiery orange. When the unmoving silhouetted trees are viewed against the ever changing celestial color spectrum, the still scene becomes a cinematic event. Stars begin to appear well before the sun’s aura fades. Their sparkling silver brilliance is held against an even colored, dark blue night sky, making the perception of depth impossible to detect. Here, the background is static and the stars sparkle with energy. Just the opposite occurs where trees appear one dimensional and static, while the sky is alive with changing color. All these theatric opposites combine in a single scene to create an inspiring, though brief preface, to the end of a November day. A walk through the November woods cannot be more dramatically different than experienced a month before. Strolling within the woods, beneath the canopy of trees, now without their leafy crowns, the lattice work of a branched arbor is apparent. Since late spring, a cloud of leaves dominated the view, banning shadows and sunlight. A day time stroll on a sunny day or moonlit night, allows light to play with trunk and limb. Gnarled branches, which fought for their place in the sun, form grotesque figures that groan in the wind. The source of the sounds impossible to locate, lend a ghostly atmosphere even in the light of day. Shadows that begin to arise from a subterranean prison at the base of large trees, appear as immovable as the tree from which it escaped. Turn away and back to find the shadow has imperceptibly moved, as it circles the tree to close the distance between you. Walk along silently on the rain and color soaked carpet of October and let your imagination run wild. Animals and portions of human like figures, frozen in the transition of creation, hang like spare parts growing from trees. While November is no one’s idea of autumn, given the cold, frost, barren landscape and introductory snowfalls, the month ends 21 days short of winter. Author Joe Mish has been running wild in New Jersey since childhood when he found ways to escape his mother’s watchful eyes. He continues to trek the swamps, rivers and thickets seeking to share, with the residents and visitors, all of the state’s natural beauty hidden within full view. To read more of his writing and view more of his gorgeous photographs visit Winter Bear Rising, his wordpress blog. Joe’s series “Nature on the Raritan, Hidden in Plain View” runs monthly as part of the LRWP “Voices of the Watershed” series. Writing and photos used with permission from the author.